Heather and Roger at Defining Studios were an absolute pleasure to work with! They really helped make our wedding day run so smoothly. They got all of the pictures we wanted and so many more! Everything came out so beautifully and they had our pictures back to us in no time at all! Our guests loved them too! They had creative ideas for photos we never would have thought of. I really can't say enough great things. I highly recommend to any couple getting married! Roger and Christina did a fabulous job! Not only were they professional and personal they went above and beyond to ensure things went smoothly. They checked out the venue ahead of time as well as the first look location. Roger contacted me to let me know about a few complications we were going to have and offered me suggestions about what to do. Christina did an excellent job capturing me getting ready and getting all the little details. Both of them were great about getting pictures of things of important significance in between taking pictures of us. They are very patient, flexible and fun to work with. Christina had several creative ways for the girls to stand and found awesome locations for the best picture. Roger did a great job gathering people and making people laugh which led to natural smiles. Everyone kept talking about how friendly and energetic they were. We are so happy we got to work with such talented people. They made it so we could enjoy our special day while capturing every moment at the same time. The quality and beauty of the photos are so wonderful! I cannot thank them enough for helping everything go smoothly and capturing every moment from the sunset to the moonlit photos! Great people to work with. They understood the look we were going for and did it spot on! They even were able to reproduce the same shot my parents had done in the same location on their wedding day. So stop looking around and pick these guys. They were amazing throughout the process. Very organized with every step - helping us set up a timeline, having us make a list of what pictures we wanted, keeping the day running smoothly. They let us know if there was anything changing (Heather was unavailable, then our second photographer sprained her ankle a week before). After the wedding, we had a very small problem with one of the videos where the audio/video didn't quite sync at first, but once I brought it up, they were quick to edit it. We got a USB with all of our photos on it, in a very cute box. Defining Studios is an excellent team! Roger, Heather and the rest of the Defining Studios team are highly professional and took the time to ensure they understand what we wanted from our wedding photography. Roger is highly professional and interacts well with guests, making them feel at ease. His enthusiasm is infectious. The photography is imaginative and very high quality. We recommend Defining Studios without reservation. Defining Studios was the best! Roger and Heather were so much fun and so easy to work with. They were very organized, creating a timeline with us for the day of the wedding. They also helped us stay on track so we didn't forget to take the pictures we wanted. So many of our guests commented on how personable and funny they were, and one of our friends already wants to hire them for her wedding! They are very talented at what they do, we love the preliminary photos from our wedding! You'd be hard pressed to find better photographers, I'd recommend them for any occasion. I truly cannot even begin to express how amazing Defining Studios is. I don’t even know where to start! From the first day we met Roger, we knew that there was no way we were going to book anyone else. He made us feel completely comfortable and gave off such positive energy - you will understand when you meet him. Then, the wedding day came and he confirmed exactly what initially drew us to him. Roger was absolutely incredible in every single way. He is clearly so passionate, talented and has such a vision for truly beautiful photos. Roger was so sensitive to all of our family picture requests during our first look photos. He kept the mood light and the focus on us! He was truly HILARIOUS and became on a first name basis with many of our guests by the end of the night. I am still getting compliments about his personality two weeks after the wedding. The conversations I’ve had with everyone who attended are along the lines of…“Your wedding was beautiful…and that photographer was awesome.” Having such a presence at our wedding AND delivering stunning photos is truly a rare find. Roger’s investment in making our wedding special was one of the main reasons why we had such a wonderful time - I truly credit him for how smoothly the whole experience went. 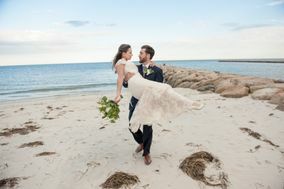 I was amazed to receive an email THREE DAYS after our wedding with a link to our “highlight” photos. These were about 100 of some of the best photos from that day, accessible and downloadable through their website. As I expected, the pictures are absolutely beautiful and captured the mood of our wedding perfectly. I also want to mention that we communicated with Heather frequently throughout the process and she was absolutely amazing as well - she unfortunately had an injury for the day of our wedding, but Christine subbed in as our second shooter and was lovely. Kevin and the videography team were great as well. I would book Defining Studios again in a heartbeat! We got married in August and had the pleasure of working with Heather and Roger for our pictures and Kevin and Adam for our video. Roger has the best personality to bring fun to every snapped picture. When the kids were running away he knew how to grab their attention for a photo. When adults were getting antsy or not listening, he politely got everyone on track so traditional photos could be taken before everyone ran away for cocktail hour. Both Heather and Roger were everywhere at our wedding yet never in the way and so sneaky at getting great candid shots without making us pose for the perfect pic. They worked with us every step of the way leading up to the wedding and made sure we had a list of important photos that they would ensure were taken and shared helpful tips and tricks in wedding planning in general that reached beyond photography and videography. While we've only seen the trailer so far for the video it is everything we'd expect from a trailer. It hints at the main plot ( the wedding!!) and left us drooling for the main video that is still in the works! We highly recommend Defining Photography for your special events. Their expertise combined with their love of what they do and the fun they bring made our wedding that much more special. Choosing a photographer should be a hard choice to make, after all they are the ones who will be preserving your memories of hopefully the best day of your life. Luckily for us, we met with Defining Stuidos first. We had already heard great things about them from our venue. As soon as we walked out of the meeting with Roger, we both looked at each-other and said let's book them! During that first meeting, he really took the time to learn about us, told us everything they offered and made sure we had all questions answered. We were both shocked at how much time he spent with us (about 2 hours) considering he just had a baby the day before-and was not feeling very well himself. On the day of the wedding they were Fantastic! They were so accommodating, they got every single picture combination I asked for and trust me they were given multiple pages of combinations. They captured all the silliness and even all the inappropriate stuff because they knew I wanted that. What is even more incredible is that within the first 48 hours of our wedding, we were sent our first look photos, a top 100 or so images from our wedding, with the remaining photos to be delivered within 4-6 weeks. I hate to say it, but I didn’t cry much at my wedding, but looking at the photos that Roger and Heather took made me tear up. Their work is spectacular, and they know exactly how to capture the images that you will treasure for a lifetime. All I have to say is great things about everyone from Defining Studios. Many of our guests also told us how great they were. We would book them again in a heartbeat! And so should you! Roger and Heather are amazing and the best!!! They are personable and professional. When we met them at a wedding expo, we knew we wanted them as our photographers. They take their time and are so talented. Our pictures are the best! Our guests thought they had a lot of energy and great personalities! Everyone loved them!!!!!!!!!!!!!!!!!! If you want great photos, book with Defining Studios. You will not regret it! After meeting Heather and Roger at my best friends wedding and then seeing how great their work was I knew I had to have them for my wedding. We had our engagement photos done with them which came out amazing. Our wedding was this past weekend and everyone was raving about them. Heather and Roger are a joy to work with and I can't wait to see how all the pictures turn out. I highly recommend them and look forward to hopefully work with them again during future milestones in our lives. Roger and Heather were absolutely amazing. I never really spent much time thinking about what wedding photographers should be like until I met with Roger for the consultation. I realized then that his personality was a huge selling point for me, simply because I knew he would make a point of mingling with my guest and getting great pictures. I was so right. All of my guests have raved about him, my aunt is even wondering if she can fly Roger and Heather down to Florida to do her wedding pictures!! Booking Defining Studios for our wedding day was the best decision! Heather and Roger are so talented, and it is clear that they are passionate about their work. They are well organized, and made sure that everything went smoothly on the day of the wedding. Roger was with us for the entire evening, and it was such a joy to have him there with us. He interacted with our wedding party and our families perfectly - everybody loved him! He was proactive about finding unique and beautiful shots inside and outside of our venue (The Society Room of Hartford), and did an awesome job engaging with the crowd! Thank you so much for the beautiful photos, and for being a part of our wedding day. I can't express enough how amazing defining studios is. I'm beyond happy I chose them for my wedding we have had such amazing feedback from our wedding on roger and heather . Roger is such a people person and really works hard to know each and every person so personable flexible, and really puts thought behind each shot he takes. The pictures are truly amazing but it is also a plus on having photographers with amazing personalities I felt comfortable after meeting with them the first time ! Highly highly recommend Defining studios you will not be disappointed ever . I will forever use them whenever I'm in need for photos to be taken ! We love Roger and Heather! They are such a wonderful team who creates stunning photos! During the family photo session they were extremely organized, which helped to move the guests to cocktail hour quickly. They are both extremely creative with their shots and capture the beauty of the day perfectly. Their turn around time for photos is unbelievably quick as well. They posted 123 photos from our day only 4 days after our wedding! I would highly recommend them to anyone who is looking for a wedding photographer! We LOVED working with Roger & Heather! Roger came out and took photos of us and our dogs at our house for our engagement shoot. He did an AWESOME job helping to keep the dogs engaged so that they would sit and "smile" for the camera. We had a unique request for a shot that involved my husband jumping over me on his dirt bike that he absolutely nailed! We got such awesome feedback from our guests since we put that photo on our save the date, I am so happy we used it! The day of the wedding was even better! I had sent R&H a link to my "Wedding Photography" Pinterest page before the wedding and asked if they could pick some from that list for photos of us and our bridal party. Heather actually printed the list and brought it the day of the wedding and checked shots off as we took them. Loved that! They did a great job wrangling in our family and bridal party for photos as well since they were not the easiest group to handle (in my opinion). We did a first look underneath a tree that overlooked a beautiful field. They staged the whole thing and caught such a special moment on camera for us! Since we had our dogs there for the first look and bridal party photos, Roger and Heather managed to get some awesome shots of them as well, which made my husband and I so happy! Less then a week after the wedding, they posted about 75 photos from our wedding onto their FB page. They came out so great and it got me so excited to see the rest! While it took longer to get all our photos back then our contract had stated, it was definitely worth the wait! We received a beautiful wooden box with a photo of us on the cover and an engraved wooden USB was inside. Such a nice touch that sets them apart from other photographers! Without the exceptional service from Defining Studios, our wedding day would not have been captured so perfectly! I cannot wait to hire them again for future photo sessions! Thank you H&R - you guys rock!!!! Roger and Heather are both incredibly talented photographers (you can see that in their portfolios) but what puts them above and beyond the competition are their personalities. These two are so fun and engaging! They interacted well with our guests all night, captured so many perfect little moments that I wasn't even aware of, and helped us feel comfortable in front of the camera. We would hire them again in a heartbeat! We're so excited that some of our friends have already taken our recommendation to hire these guys for their wedding - we can't wait to see them in December! Defining Studios provided two (2) photographers for our wedding & reception (Rodger & his wife Heather - the co-owners of the studio) & it was absolutely amazing! We cannot stress more how great a job they did photographing us getting ready, our first look, the ceremony, & the reception afterwards. Both Rodger & Heather were extremely interactive with us & our guests & did a great job setting up photo shoots while keeping everything fun. They were so friendly & good with everyone from our adult guests down to toddler guests that they were more like two additional (& extremely fun) guests than paid vendors - except for the fact they produced an amazing photo album for us by the end of the night! Rodger ended up staying for longer than his contracted time with us to make sure to catch everything up until the end of the reception. Furthermore, beyond being our photographers, they ended up setting the pace for the night & keeping everything on schedule more than any of our other vendors; my wife and I were extremely grateful for this since honestly neither one of us had a clue how our wedding night ought to go. She was never the type to give any thought to what she wanted her wedding to be nor am I & yet Rodger & Heather worked with our caterer & DJ to create a perfect experience, often having to overcome our own inexperience & indecisiveness to do so. Would recommend them to anyone. They were very clear about what each package they offer comes with & made it easy for us to select exactly the service that works for us for a price we were willing to pay. Defining Studios is wonderful, I cannot thank them enough for their beautiful work capturing our wedding day. Not only is their work top notch, they are fun people to be around. They kept our bridal party laughing the entire time, keeping things light yet still organized to fit in all the shots we wanted. I would recommend Heather and Roger over and over again to any bride and groom, thank you both for capturing our wedding memories so perfectly! LOVE THEM!!!!! Roger and Heather are so amazing and so wonderful to work with. I was so nervous and anxious about the whole wedding day and as soon has heather and Roger arrived, i felt sooo much better. they took control of the timing and where people need to be. They communicated with the DJ and kept everything so organized. And of course.... the pictures are wonderful!!! I am so happy with all of them. They do amazing candid shots and staged pictures. I found Roger and Heather at a wedding expo and from the moment we met, I knew they were going to be awesome to work with. All of our guests thought they were so awesome and they have such great personalities. They made everyone feel comfortable, which made the process of family photos easier and the picture come out so much better. Roger and Heather were wonderful to work with. From the first meeting, to the engagement shoot, to the meetings before and to the day of, they were professional yet friendly and made us very comfortable. The day of the wedding they made sure to get the pictures we wanted efficiently so parents and grandparents didn't have to wait around after the ceremony. They made an effort to remember the names of the bridal party and family which helped immensely when organizing people in photos. We never had to wait on them as they were always available for some of the more candid shots that randomly came up as the day went on. We have had multiple complements from family and friends about how much fun Roger was at the reception. He got along well with all of our guests and made sure that he got the pictures we wanted without ruining the experience of the wedding. The pictures turned out beautifully and our families especially were happy with having access to some of the photos so quickly after the event. From the moment we met Roger at an Open House for the Pond House Cafe we knew we had to have him photograph our wedding! Roger is very personable and did a great job getting most if not all of the shots I wanted at the wedding (despite me running behind schedule due to transportation). He also went above and beyond at our engagement session and listened to all of my crazy ideas and captured all the moments I wanted perfectly. Two days after our wedding we had over 150 preview photos from the day and we couldn’t have been more excited to see them while away on our honeymoon. We cannot wait to see the rest of the photos in a few weeks. We also recently got our sneak peak video and couldn’t be happier. Defining studios captured so many great memories from our wedding day and we can’t thank them enough. Don’t look any further when looking to book a photographer or videographer, they are simply the best! You won’t regret it! I ca not say enough good things about Roger. Our wedding was on 6/24/2018. It feels like it was yesterday that we were getting ready for the "Big Day". Everything happened so fast. I am so glad that Roger took all of those nice pictures . we love sitting down and looking at our pictures once a while.